Base class for strings related to binary specimens. Definition at line 13509 of file binaryInstruction.C. When retrieving the string, if escape is true then escape special charactes like the would be in C source code. The base class implementation cannot be called and exists only due to ROSETTA limitations, otherwise we would have made them pure virtual. 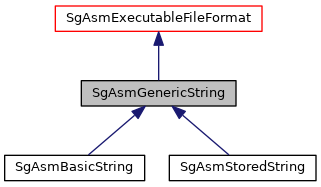 Reimplemented in SgAsmStoredString, and SgAsmBasicString. Referenced by SgAsmLEFileHeader::dump(), and rose_rva_t::to_string(). Constant for addresses of unallocated strings. Definition at line 13527 of file binaryInstruction.C.